WE HAVE MADE FRIDAY NIGHTS IN DECEMBER ESPECIALLY CHRISTMAS PARTY FRIENDLY, WITH THE BEST OF BLUES, ROCK 'N' ROLL & RHYTHM & BLUES. A little lady with a big voice, you can't help but smile and tap your feet to her explosive mixture of rhythm and blues, and she's bound to make you want to dance! Her 5 piece band work to bring you a sound that is inspired by Sister Suzie's favourite artists such as Big Mama Thornton, Elmore James, Leadbelly, Irma Thomas, Big Joe Turner to name a few. Bright, fresh and energetic Suzie really is one to see live. Andrea Pozza is considered a "true jazzman", and an eclectic pianist capable of handling any repertoire with great ease. He has been active on the national and international jazz scene for nearly 30 years and is recognized by critics and audiences as one of the most representative figures in jazz. Also a recording artist for Luton's 33 Records, this is Andrea's first time to The Bear Club with his UK Connections Trio. Over the last four years he has given a series of concert performances of these tales with specially written underscore by Richard Sisson at London’s Kings Place to great acclaim. For this concert they are joined by violinist Sophie Mather for salon pieces by Edward Elgar and the première of a new score for Crompton’s William and the Musician. JFK Blue have a fresh take on well-crafted rock and blues, with stirring songs and superb musicianship. These are musicians with one aim - to play their style of blues and rock with freedom of expression, not to get hung up on genres but to play music that they like. In doing so their music is contemporary yet has a retro feel which brings familiarity and joy. People have commented that they have an Southern Rock feel combined with melodic songs and great hooks. ‘Rough Round The Edges’, the band’s debut album, is made up of totally self-penned material, and it has received critical acclaim, having been played on BBC Radio2, Planet Rock and many other stations. Paul Jones on BBC Radio 2 said : “A very impressive debut album from this London band, Chris Elliot has a terrific voice and has top drawer instrumentation around him”. After doing an all too short support slot last year, we are delighted to welcome back the full band line up of The Rosellys. A perfect fit for the club and a real treat for anyone into their Americana. Beautiful harmonies, an array of instruments, including pedal guitar, make this group stand-out on the UK scene. 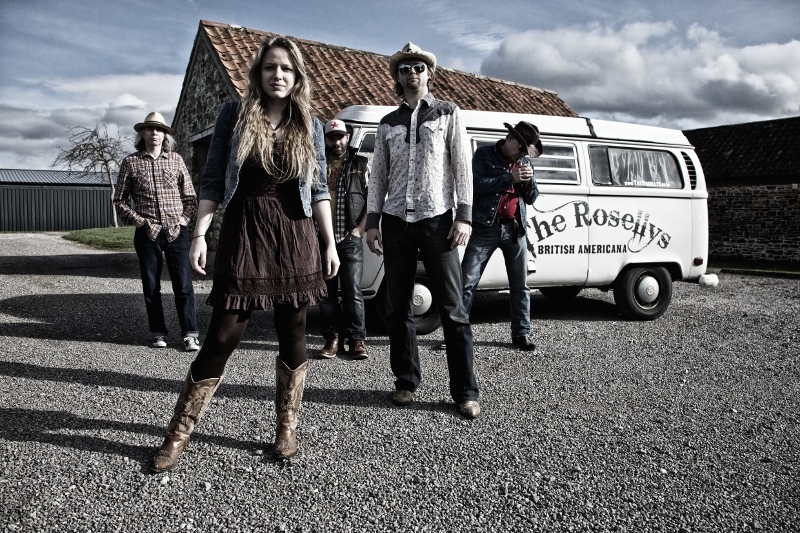 "The Rosellys are a band who make no apology for their love of Americana. Musically, they blend English accents with lyrical references to both the UK and US alongside well pitched bass, feisty drum beats and stunning pedal steel and fiddle to create a sound that walks the fine line between Celtic folk and Americana"
Headlining the night will be 'the voice of Love Island', Iain Stirling. The last few months have seen Iain's fame skyrocket, with tickets for his Edinburgh run selling out before he'd even arrived. He's just announced a headline show at The Hammersmith Apollo, so catch him up close whilst you still can! Opening the night is star of 'Live at The Apollo', 'Have I Got News For You' and 'Would I Lie To You', Phil Wang. Phil received rave reviews at this year's Edinburgh Festival and is another comedian on the cusp of full on stardom. Steve is a great comic that has supported the likes of Russell Kane, appeared on Stand Up Central and written for all your favourite panel shows. He recently sold out Leicester Square Theatre performing his latest solo hour. The night will be compered by the wonderful Simon Feilder. Simon is a firm favourite at The Bear and completes a very special Christmas line up. BBC Introducing is bringing three of their favourite new artists to Luton for a free gig at The Bear Club. The night will be recorded and broadcast over Christmas. This summer Grace played our stage at Standon Calling Festival and we loved her so much we just had to bring her to The Bear Club. Taking influence from the likes of Sia and Christine and the Queens, Grace has had support from BBC Radio 1 and BBC Radio 1 Xtra. She’s certainly one to watch in 2018! Live performance is at the heart of what Etham does and where his incredible voice has to be heard. He’s been busy on the road supporting the likes of Ella Eyre, J.P Cooper, Sigrid, Astrid S, James TW, Justin Bieber & Tom Walker. He's gained over 2 million Facebook views on his recent tracks and entered the 'Viral Charts' on Spotify. For years The Wholls have dominated the local music scene with their high energy and electrifying live shows. Last year they played a set at the BBC Introducing Stage at Reading & Leeds Festival, and featured as BBC Introducing Track of the Week on BBC Radio 1. This is a unique opportunity to see the band in an intimate venue with a special stripped back set. A four-piece Rockabilly band with a Western Swing feel. Serious about their music but a helluva lot of fun too. Tina May, one of 'the great' jazz singers, and a mesmerising vocal performer, returns to her favourite Bear with a swingin' jazz show featuring Dave Gordon on piano and Steve Brown on drums. Tina is an international jazz star, and we are delighted to welcome her back for what is becoming a bit of a December tradition, and so far every show has been a completely different musical experience. DJ Ginger John's laid back gig, bringing contemporary sounds to the vintage walls. FREE. Last year's Christmas party was so popular, and over-subscribed, we thought we'd throw two this year, both with fun loving' Bear style bands. There'll be mulled wine, mince pies, special Christmas Gin & Tonic and warming spiced malts. *except for the odd special event. Gotta pay those bills.